The Food thermicator II® incorporates the accuracy of full range digital reading and the simplicity of analog targets in the cooking range with extra large, easy-to-read LCD. The digital electronic circuits that energize the Food Thermicator II® are engineered for optimum range, accuracy, precision, battery life and reliability. 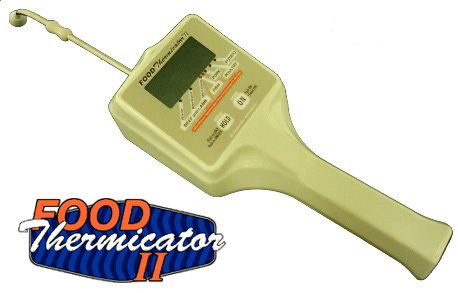 The Food Thermicator II® senses temperature only at the extreme tip of the needle probe thus giving the true internal food temperature at your desired immersion point. It is not influenced by oven or grill heat, nor does it average inside to outside food temperatures. The adjustable needle probe, which can be extended to 3.5″, penetrates foods with no unsightly markings. Its ability to check temperatures of “doneness” and critical temperatures in bacteria-control areas, such as bone joints, helps insure proper food preparation. The Food Thermicator II® is encased with a molded, reinforced, impact-resistant plastic housing. The adjustable, stainless steel support arm and needle extend 9″ from the contoured housing allowing the sensing needle to variably adjust up to 3.5″ through slide-seals. The 22 ounce, weight balanced housing has a comfortable grip with strategically located ON and HOLD push buttons.